A simple fruit dip perfect for dipping fruit or vanilla wafers made with cream cheese, marshmallow fluff and a splash of vanilla extract. Today I'm posting a recipe for a simple Fluffy Fruit Dip. This dip just so happens to be my kids favorite dip. I previously posted a recipe for a Creamy Caramel Apple Dip a couple weeks back. Well the kids liked that dip as well, but the fluffy fruit dip doesn't have any fancy shmancey ingredients so they like it so much better. This recipe is just a plain sweet creamy fruit dip. There are a lot of dips that my kids wont eat so this is fruit dip is a great standby. Plus it is a great was to incorporate some fruits into their diets. Don't stop at fruit because this dip is also great paired with some graham crackers or vanilla wafers for dipping. My favorite is to use apples, bananas, strawberries and grapes. I know this is fruit dip has been around for awhile but most folks seem to forget about it. So today I'm just posting a little reminder in case you're looking for a simple kid friendly dip. Speaking of dips today I'm also having a quick giveaway! 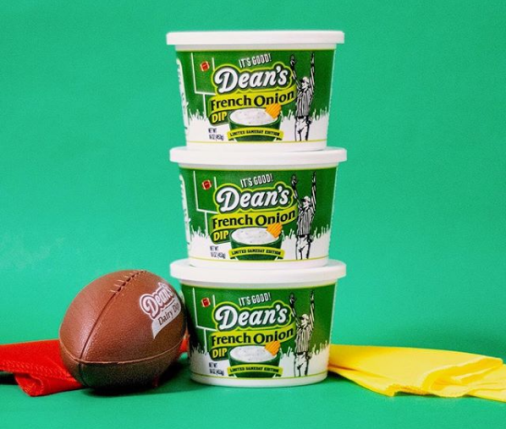 Are you a fan of Deans Dip? Well, I am and no tailgating or super bowl party would be complete with out a few tubs of Deans Dip on the table. My top favorite has to be the French Onion Dip. I just saw that Deans has a new Cheese Flavored Pretzel Dip. I cant wait to get my hands on that one. As of now I still can't find it in the stores, but as soon as I see it you can bet I will be buying a few containers. I also wanted to let you know that Deans Dip is hosting a Sweepstakes called Deans Dipstakes. We all know that each football team has their own rival, so it's no different for dips to have rivals of their own. Are you a Honey Mustard loyalist, Guacamole die hard or an Onion Dip fanatic? Vote on your favorite dip while predicting the outcome of the games each week and you’ll be eligible to win awesome prizes like tailgate party supplies, football memorabilia and sporting gear. There will also be a big grand prize drawing in January for a home entertainment system. Like fantasy football, but tastier. It’s Super easy to play as well Just Pick your dip and pick your teams!! Don't forget you want to get your main entry in at Dipstakes.com, all you have to do is enter your name and address. Contest open to US Residents only due to shipping. I will randomly choose a three winners on Tuesday January 19th 2010 using random.org. Each winner will have 48 hours to reply or I will choose new winners. If you are not a registered blogger please leave your email address in your comment so I can contact you in the event that you are one of the winners. Whip together and place in a bowl. Serve with any fruit of your choice. I love the French Onion! Thanks for the giveaway! I'd love for you to follow me on twitter and on my cooking blog, as well! My favorite is definitely French Onion! I am following Dean's Dip on Twitter. French Onion Dip with Wavy Lays potato chips is my favorite. MMMM!! I am a Ranch girl! I became a follower of yours yesterday...does that count? French onion is the best! I love their French Onion dip. Yum! Love your recipes. My favorite dip in the guac. I make this fruit dip only it has a little powdered sugar mixed in it too. I love strawberries and apples dipped in it! There's nothing better than good ole French Onion Dip! I am a fan of Dean's Dips on Facebook. I follow Dean's Dips on Twitter: JanelleKC. I love the french onion! My favorite Dean flavor is French Onion! Thanks so much! I also became a follower on facebook! I became a follower of deans on twitter! I'm a fan of dean's on facebook! I love the ranch dip! Its so good with chips! Definitely the French Onion Dip with my potato chips. Yummy! Tried and true,french Onion for me, although I would like to try that new one you were talking about. interesting read. I would love to follow you on twitter. By the way, did anyone learn that some chinese hacker had busted twitter yesterday again. I love the french onion and I love that fruit dip. Can eat it by itself. I LOVE Dean's Dip... my favorite is the French Onion. Santa always bring a big bag of Ruffles chips and a BOG container of French Onion Dip for the family to enjoy on Christmas. Many Blessings! Ummm.... Dean's Ranch dip is my favorite. My favorite Dean's Dip is guacamole. Your fruit dip sounds tasty- I'm sure my kids would eat more fruit if I served this dip with it! Thanks. I'm now a fan on Facebook, I look forward to your future posts. You can substitute a package of strawberry gelatin for the vanilla and it is delicious.